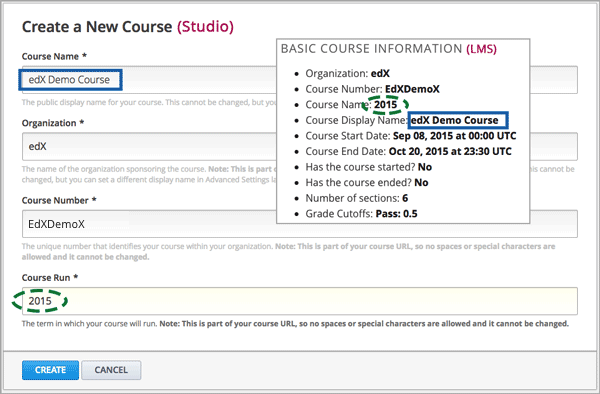 After you create a course in Studio, you can access information about it from the Instructor Dashboard. 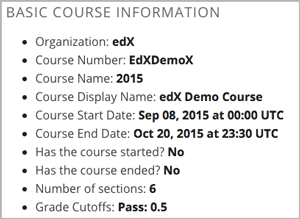 Additional data about the course and its learners is available from other pages in the Instructor Dashboard, and from edX Insights. To access the data visualizations, metrics, and reports of Insights from the Instructor Dashboard, select the link in the banner at the top of each page. For more information, see Using edX Insights. Select Instructor, and then select Course Info if necessary. Course Start Date: The date and time that the course is scheduled to start. This date can be changed in Studio (not recommended if your course is live). For more information, see Determining Start and End Dates. Course End Date: The date and time that the course is scheduled to end. This date can be changed in Studio (not recommended if your course is live). For more information, see Determining Start and End Dates.